OK, so you wake up, for no good reason, at 5.30am... what to do? Well, one thing is realise that you have rather neglected the website a bit. And it would be remiss to not have a Christmas greeting to Junkketeers far and wide (there may even be an actual 2011 year-end - well, annual, as I think it will be the first - newsletter next week). I really should have created something whizzily reuseful and original, but that ain't gonna happen today (once I open my presents later, maybe), so was stumped for a picture. Then I hit upon the true spirit of Christmas, with a side order of innovation and reuse (well, 'ish), in the form of this picture. The boys, of course, will not emerge until midday, but here are my prides and joy doing what comes naturally during the season of goodwill... trying to knock each other off bikes with jousting poles. I guess I should be glad they have at least put boxing gloves on the ends. And they are outside. Not zapping aliens. What more could a proud parent hope for? 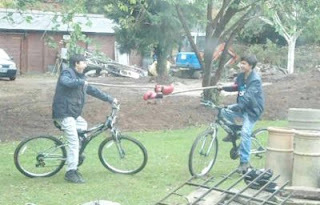 Hey, who says growing up can't be fun? Today I reached another grand age. Not old, but suffice to say, the 'middle' qualifier is a stretch to any with a command of basic maths. However, bless 'em, they had been pestering me what I want for my Birthday for a week. Thing is, I usually go and get what I need, and what I want seems a luxury these days, so it's not top of mind. Then fate intervened last night. We were wandering around Morrisons, and there they were. 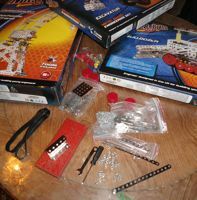 Yes, you are looking at 3 metal component construction sets. By FIA toys, of the UK. Better still, guess how much? The two wee ones were a fiver, and the monster... £10. Bang on teen budgets. And first impressions are... sweeeet. I may not make the actual intended toys, but I now have a ton more stuff for my prototyping adventures. There is no mention of Meccano, so I can only presume they are competitive. Certainly the hole spacings are different, which is a pity, but the hole diameters are a good enough match to engage in some cross-over, which is a real plus (see pix - green and red 'old' Meccano, silver this new stuff). The quality of metal is nowhere near comparable, but it will suffice for my needs, and beats plastic hands down. The only critique I'd have is the box, which is pretty big for what's in it, and the foam liner tray, which is unnecessary. But otherwise, my fun, and hopefully more productive avenues (major prototyping underway on some post RE:tie Junkk.com reuse projects), are assured. And despite still being a big kid, I feel all grown up. Thanks boys and missus... best prezzie I could have wished for. Who knows, maybe even lure them from the XBox as I tinker? Well, a boy... man... old guy can dream. Given the rather more interesting and historically significant other sheds featured in the series, my rather more prosaic place of inspiration seems a little sore thumb in such company, but I'll take what is offered! Shame no Junkk.com mention, which is what I was gunning for of course!